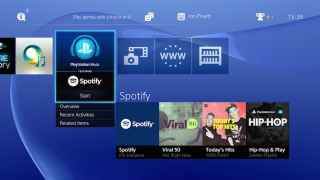 Spotify now available to PS3 and PS4 owners through PlayStation Music | What Hi-Fi? PlayStation 3 and PS4 owners can now experience Spotify through Sony's new PlayStation Music platform. A Spotify app is now available to download to your games console, or you can use one of Sony's Xperia devices to link your Spotify and PlayStation Network accounts. If you used to subscribe to Sony's now defunct Music Unlimited service, you can take advantage of a 60 day free trial of Spotify Premium. New and existing Spotify users can get one month free (as long as you've never had a free Spotify trial before). PlayStation Music will launch in 41 territories and will allow PlayStation Network's (PSN) 64 million users to link their accounts with Spotify - and have the option of signing up to a Premium subscription through the PSN wallet. Sony's Music Unlimited service will close on March 29th 2015, which Sony says is prior to the launch of PlayStation Music, could it be it will arrive on March 30th? We can't say for sure. Gamers who link their Spotify accounts will be able to access songs and playlists from within games, and use the music as a soundtrack. But this will only be available on the PS4 and not the PS3. Users will also be able to create collections and playlists, and access playlists curated by other Spotify users. Sony has confirmed that PlayStation Music will support both Premium and ad-free Spotify accounts, but hasn't said if subscriptions will stay at £9.99/month. Andrew House, president and group CEO of Sony Computer Entertainment Inc., said: "Music is a core component of the entertainment offering that consumers expect from Sony, and our goal with PlayStation Music is to provide the most compelling music experiences to the millions of PlayStation Network users around the world." Daniel Ek, CEO and founder of Spotify, added: "We are incredibly honoured to partner with Sony and PlayStation to give gamers around the world an amazing experience wherever they listen to music." Users can register their interest to receive more news on the service here. Sony's Music Unlimited service launched in 2010. In 2012 Sony reported that it had just 1 million active users, despite being bundled with the PlayStation console and Xperia smartphones and tablets.